"Maybe we should have gotten 4-wheel drive on this truck!" This entry title, deliberately vague, doesn't refer to our feelings about being in Virginia instead of on the road. We've been at our house less than a month and we're itching to go back out West again but Jim has two races on his schedule on this side of the country and plenty to do before we hit the road again in early May. Me, too. In fact, I'm afraid I won't be able to do everything I want/need to do before we leave again. In the last entry I mentioned that we didn't get 4WD again because we didn't use it much on the previous truck. 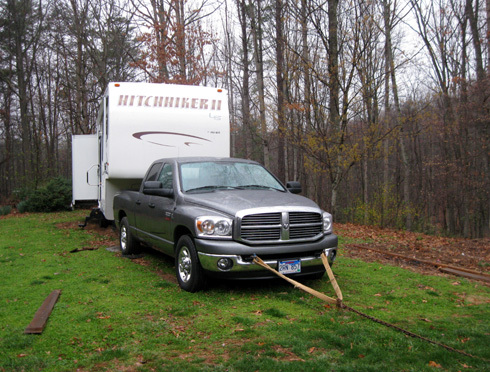 The diesel Ram has just as much power as the Ford to pull our 5th-wheel camper, so we figured we'd save money on fuel (less weight) and the initial cost of the truck by getting a regular old 2WD truck. In hindsight, that might have been a mistake! One of the things that 4WD feature apparently is good for is getting the camper out of our back yard when we're ready to leave on a trip -- at least when the ground is saturated and the rear wheels literally can't get a grip. Originally we had motel reservations for the Umstead 100 this weekend but a couple days ago we decided yes, it's worth the effort to take the camper down to Raleigh for only two nights. It's more convenient to be able to stay closer to the race site and Cody could stay in the camper while Jim was running and I was volunteering in the timing tent Saturday morning. The temperature was predicted to be too warm to keep a dog in our truck or van for eight hours. 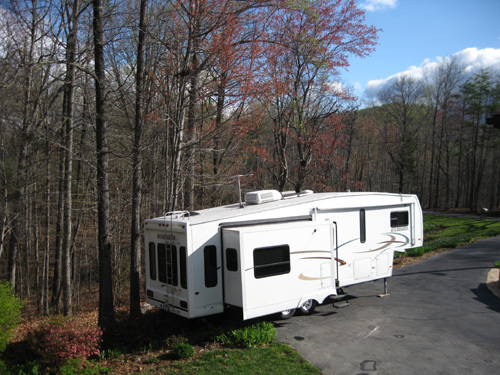 Fortunately, Jim decided to pull the camper onto our paved driveway a few days before the race so he could work on the brakes and determine if we should get new tires this spring. That was a good decision. Unfortunately, we've gotten a lot of rain (much needed) since we got back to our house a month ago and the formerly-plowed "garden" area where we park the camper was soft mud under the weeds, not firm like the established lawn between it and the driveway. 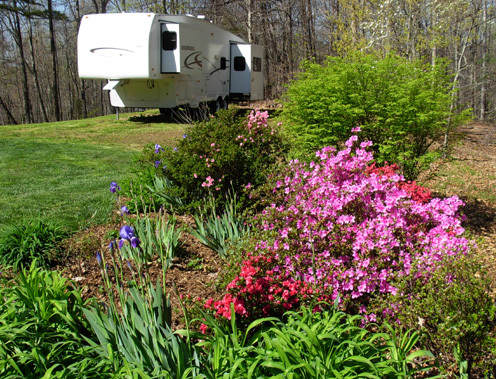 When Jim tried to pull the camper onto the driveway Tuesday it wouldn't budge. The rear truck wheels simply spun and spun, digging deeper and deeper into the mud. He could back it up a little each time to try to get better traction, but soon he was getting close to the woods and couldn't go back any farther. The next logical step was reducing the weight in the camper. After each trip we take most of the food, clothing, running gear, files, books, and other items out of the camper, so it was already at a lighter weight than when we're traveling. Jim emptied all the water from the tanks; that didn't help. We decided it was too much work to carry out the sofa bed or desk, the heaviest furniture inside. Jim's got chronic back problems and I've got more recent shoulder problems (more about that in another entry). I came up with the brilliant idea of gathering up all of our outside door mats and sticking them under the rear wheels for traction. Jim didn't think it'd work but he was out of ideas. He'd already tried boards and mulch under the tires, to no avail. The mats were no better -- they went flying when Jim tried to pull forward. Worse, they were now caked in mud and required hosing off. It was also getting dark. Back to the drawing board . . .
We really didn't want to pay for a tow truck to come extricate both the truck and camper from the back yard. We could get the truck out but not with the camper attached. We're talking about approximately 12,000 pounds for the fairly empty trailer plus however many tons the truck weighs. My next idea was better, although we had to swallow our pride: we called one of our neighbors, Wayne, who has lots of big equipment stored in his barn for his construction business, including a tractor, dump truck, and front-end loader. 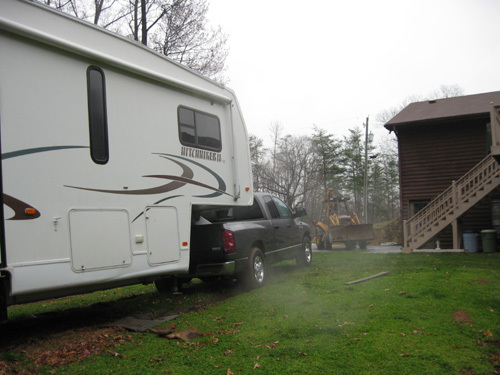 He agreed to come out the next morning to try to pull the truck and camper onto the driveway. I figured he'd use a winch and the dump truck. He came tooling down our little road with his front-end loader and a big rope. Shows how much I know about stuff like that! His method worked just fine in only a few minutes. Wayne graciously refused the money we offered him, encouraging us to "pay it forward" by doing a favor for someone else. We'll be looking for an opportunity to do that! Although we had no trouble getting the camper up a greater rise when we left our slanted, DRY grassy site at the MS 50 race a month ago, we'll have to be very careful from now on how we park the rig when we're traveling. The truck had plenty of oomph to easily climb long hills on our way back to Virginia but now we know that traction is a major factor to consider if we have to stop on an upslope. That could mean loose gravel, wet grass, and snow as well as mud. Camping is just one adventure after another!